The Real Deal has ranked top rental building owners in the past, and those landlords tend to own huge buildings and have sophisticated management and leasing systems in place. To identify landlords or developers who focus on smaller buildings, a broker can use our TRData website. The first step to filtering TRData for midsize properties is to determine the method of measurement and the size of the property you’re interested in. On TRData’s Advanced Search page, choose the ‘Properties’ tab. At the bottom of the tab is a field labeled ‘Filter by Size’ with the several options in a drop down, including Square Feet, Floors, Height, Residential Units, Commercial Units, Hotel Units, and Total Units. For this example, we’ll choose Residential Units and select the range to show buildings with between 5 and 20 residential units. If you wanted to further narrow the results, you could choose a specific borough, neighborhood, property type or even a date range of when a filing was made or permit received. After selecting the number of residential units in the properties we want to display, we’ll click Filter at the bottom of the Advanced Search to display the first 200 of over 34,000 properties that meet these qualifications. To view the firms and people that own the largest number of these midsize properties, we’ll use the Ranking function at the top right of the Advanced Search results. Select “Owner” from the drop down and click the Ranking button to pull up a new window with a ranking of the owners of these properties. 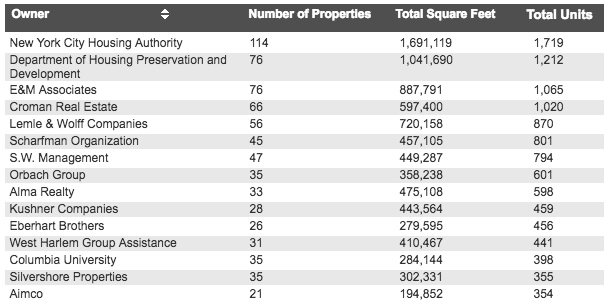 You can sort the results to show a ranking of the companies that own the most of these midsize properties, the most square feet and the most residential units in those buildings. If you’d like a buy a list of these properties or their owners, contact Derek Smith, at ds@therealdeal.com or call (646) 503-3561.